What you see in the photo above is a very nervous man on a very expensive bicycle. 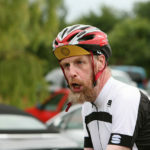 It’s me setting off on the Gog Magog Gran Fondo a couple of weeks ago on a Colnago V1-r. I borrowed one of Colnago’s demo bikes for the day from Steve at Primo Cycles. I’d been planning to ride my own old Trek but I saw that demo rides were available and asked Steve to sort one out for me. I gave him less than a week but he came up trumps. The V1-r is a genuine superbike. It says so in a supplement to the current edition of Cycling Plus on the bikes of the Tour de France so it must be true. It weighs about as much as a snotty tissue but it looks the absolute business. The one I had was matt back with red highlights. You can have it in white and black, black on black, black with yellow highlights or black with white. Mine was a feast of Italy. It had Campagnolo gears, Super Record at the back and Record at the front but the brakes were Colnago’s own. 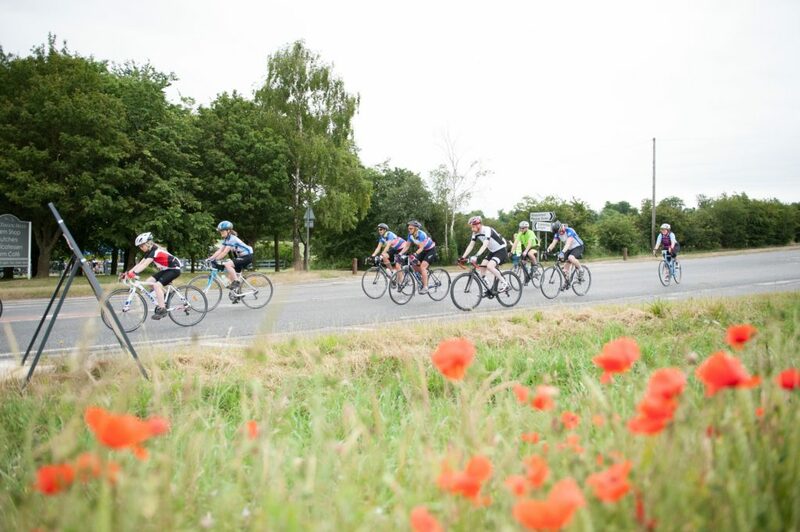 The bike’s aero flavouring put the rear brake under the bottom bracket which was excellent for keeping it out of the wind but gave it other issues when it came to losing speed in the grotty, damp conditions. The carbon wheels come from Vision. They’re Metron 40s (oooh, Metron!) I hadn’t ridden with carbon wheels before and it took a while to get used to the way the brakes worked. To be honest, they didn’t really work in the rain and then they worked really quite a lot indeed when the brake blocks had cleared the dampness from the braking surface. This gave me a few brown bib-short moments coming down to junctions at the bottom of some of the wet descents. The way the Campag gear changers work didn’t help. I’m used to Shimano. The Ultegra levers and derailleurs on my Trek are as smooth as a baby’s backside. The best I can say for the gears on the Colnago is that they’re positive and reward positivity. I was positive I didn’t like them. Slowing using the scary no-brakes-then-lots-of-brakes, unclipping to get my foot down and changing down the ratios on my way to a junction was too much for my little brain to handle at times. It got better with familiarity and to be honest, I think the bike needed a thorough service. God knows how many other cack-handed riders had been using it recently. It felt just a little tired and the rear mech in particular had a rattle on the lower ratios. I called it a day after one particularly hairy moment when I nearly stacked it coming down a hill to a T-junction with the only busy road on the entire route. The actual descent was joyful. The bike is rock-solid at speed. Pick your line and the bike follows it with no nervousness at all. It’s not the least twitchy. It’s basically built to go very, very quickly indeed. After my near-spill, I diverged from the 80 mile route and headed for Bicicletta in Saffron Walden to gather my thoughts, dry off a little and have a coffee. It’s a very fine bicycle indeed, this. It’s almost impossibly comfortable. My Trek rides on 23mm tyres. The Colnago had 25mm ones and the little extra air volume combined with all the knowledge gained in designing carbon fibre bikes in the years since the Trek was built make a huge difference. Only the saddle let me down. In truth, it demasculated me. The handlebars have little flattened bits on top and provided a very comfortable place to rest my hand when I was on the hoods. That wasn’t often. It really wanted me on the drops and driving the pedals. When I did get into a tuck and give it some, the bike responded. I could feel it slicing through the air, every turn of the pedal making a difference. It has a little Ferrari badge on the top tube along with the legend in collaborazione con Ferrari. It’s only been in the actual Ferrari wind tunnel. I don’t know how much of this is down to engineering and how much is feel-good marketing, but the bike did feel fast. I didn’t want to give it back when I got to the finish. It was wonderful. The thing robbed me of feeling in my bits for about three days afterwards but I still wanted it in my life. I said as much to Steve who said to keep it for another few days. It wasn’t going straight back to Colnago. So that’s what I did. And on Monday I worked all day and didn’t get out for a ride. And on Tuesday I worked all day and didn’t get out for a ride. Wednesday, I took the posh bike out and gave it some. I set a handful of PBs on Strava including going up and over Chapel Hill towards Barrington and coming home along the A603 from Orwell to Barton. I’m not the best climber in the world but the bike gave me the confidence to push down the hills and when I had a bit of a tailwind, the aero properties of the frame really shone through. It really doesn’t waste the watts. It’s available with disc brakes now and I’d have mine with Shimano instead of Campagnolo because that’s what I’m used to. It’s gone now. There is a Colnago-shaped hole in my life into which I’m trying to push a Trek-shaped plug. It doesn’t fit. It doesn’t fit at all. You’re probably expecting me to diss my own bike now but I’m not going to because it’s brilliant too. It’s older and a little heavier but I smashed a Strava segment on the Trek last week I didn’t get close to on the Colnago. 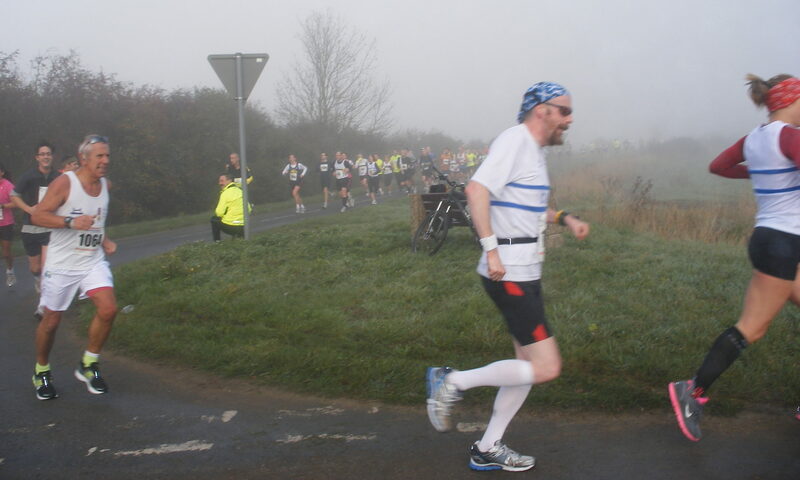 It’s a sprint from St Andrew’s Church in Cherry Hinton to the roundabout at the bottom of Airport Way. It’s the final part of most of my rides, a good way to burn off the last little drops of energy. The Trek and I nailed it last Sunday. In truth, the V1-r is a much better bike than I am a rider, even with its weird levers and scary brakes. It’s not about the bike after all. With thanks to Steve at Primo Cycles and to Colnago for the generous loan of the bike. Steve has a V1-r frameset in stock and for sale at £3000. A V1-r with the Campagnolo gearset and Vision wheels like I had would cost about £6500. It’s worth every penny. 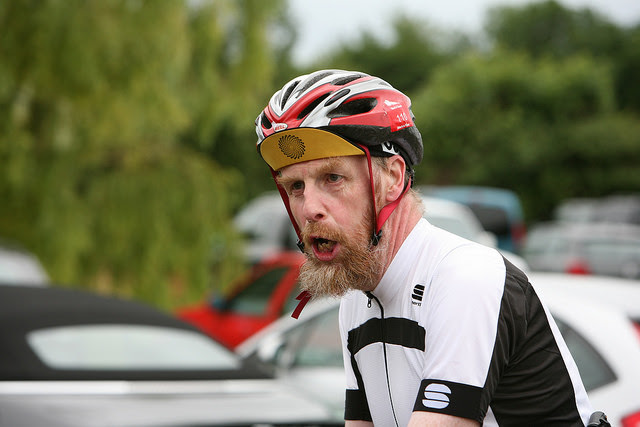 In case you doubt me, here’s a photo of me at the end of the Gog Magog Gran Fondo. See what it does to a handsome man like me.